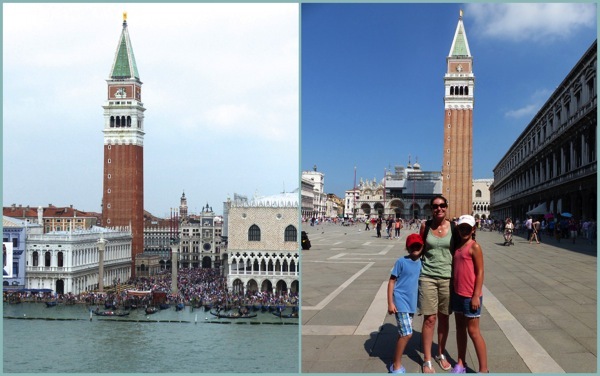 Poet Percy Bysshe Shelley described Venice as “Ocean’s nursling.” But who knew that an 86,000 ton cruise ship could sail quite this close to it? 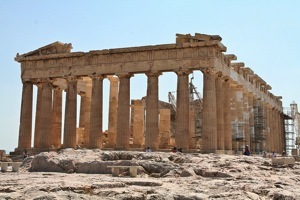 Picture the Parthenon, the ancient temple on Athens’ Acropolis. What shape is it? If you’d asked me three weeks ago, I’d have said cuboid. But no! 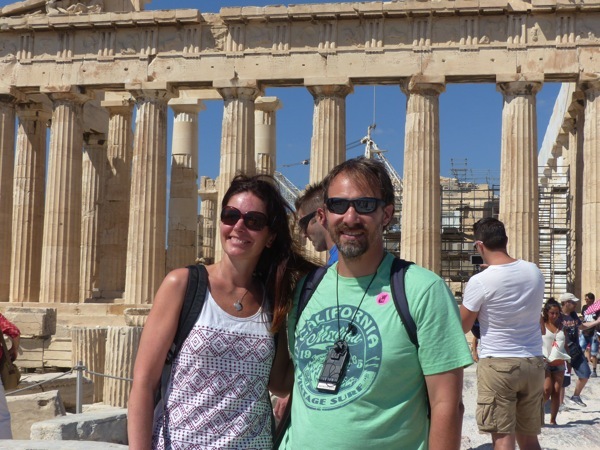 The Parthenon contains no right angles and no perpendicular lines. Because the Parthenon perches on a hilltop, if it were cuboid it would look like its columns protruded outwards from the ground up. To counter this – and to make it look cuboid – the Parthenon is actually pyramidical. Yes, if you extended those columns way up into the blue Athenian sky, they would eventually meet. Clever, eh? 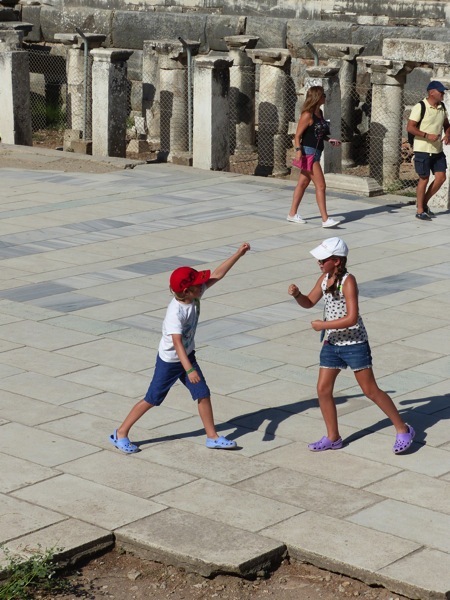 Even with less than 20 percent of the site excavated so far, the ancient (and earthquake-prone) city of Ephesus on the west coast of Turkey is the biggest Roman settlement uncovered in the Eastern Mediterranean. The photo above shows the 25,000 person theatre in which Paul is said to have talked to the Ephesians about Christ. He was so persuasive that the local silversmith, who made his living selling idols of the Greek goddess Artemis, turned the city against Paul. After Paul was exiled, he continued writing to the church at Ephesus; his Epistle to the Ephesians is recorded in the New Testament. 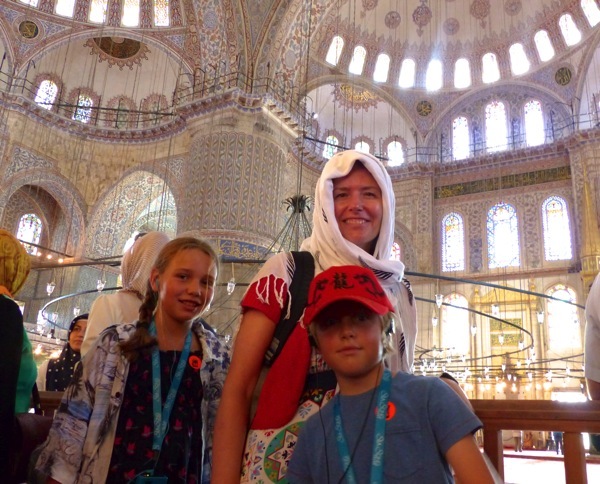 It was real hands feet-on learning for C(10) and J(9) as they took off their shoes to enter Istanbul’s Blue Mosque. 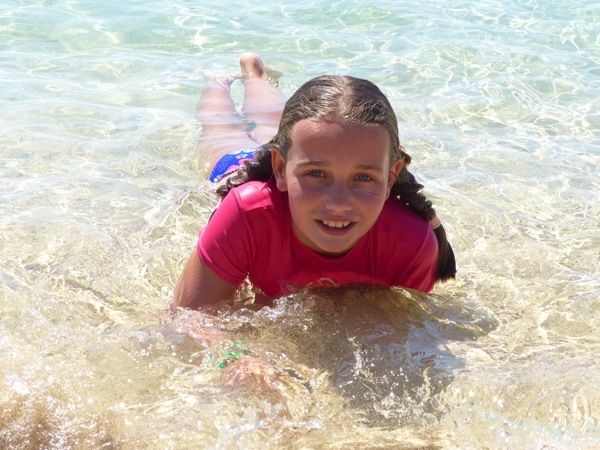 C(10) also had to cover her shoulders, and adult women covered our heads. 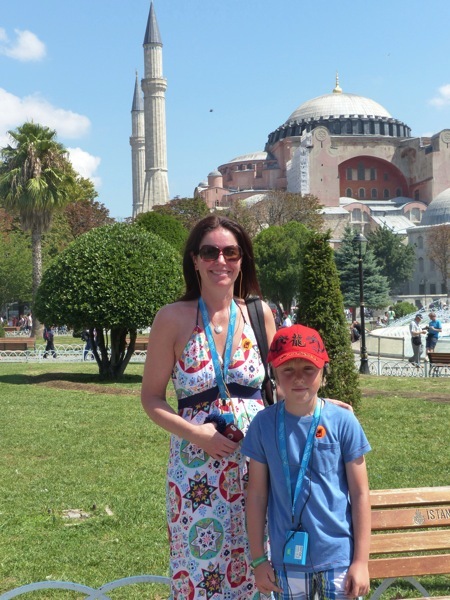 This version of the Hagia Sophia cathedral was built by Byzantine Emperor Justinian in 537 AD. 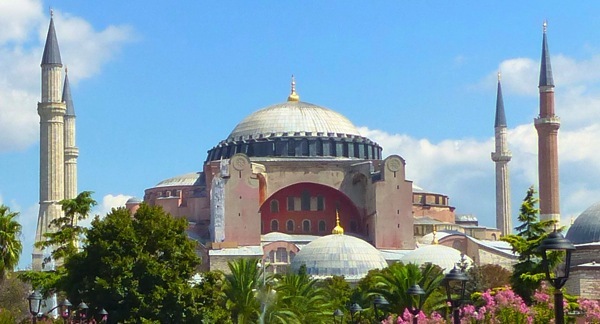 Together with its two predecessors on the site, Hagia Sophia stood as the crowning jewel of the Eastern Orthodox Church for over a thousand years. When the Ottoman Turks conquered Constantinople in 1453, they were so impressed by Hagia Sophia that instead of destroying it, they added minarets and other Islamic features, and turned the church into a mosque. 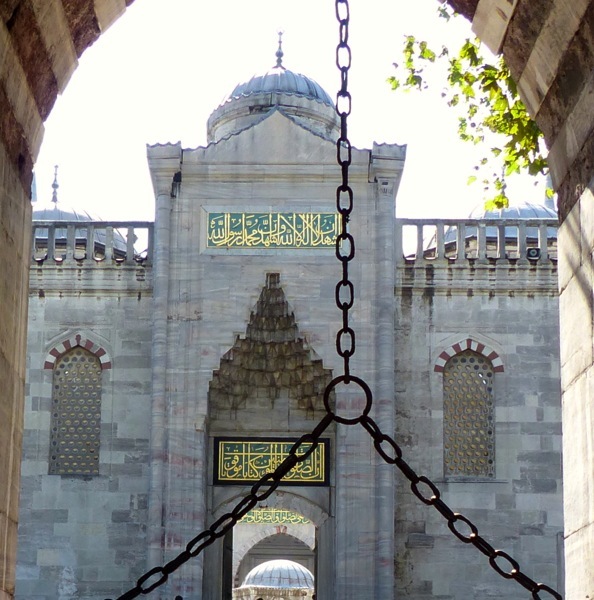 In 1935 Kemal Ataturk – the founder of modern, secular Turkey – uncovered many of the church’s Christian decorations and converted the building into a museum. 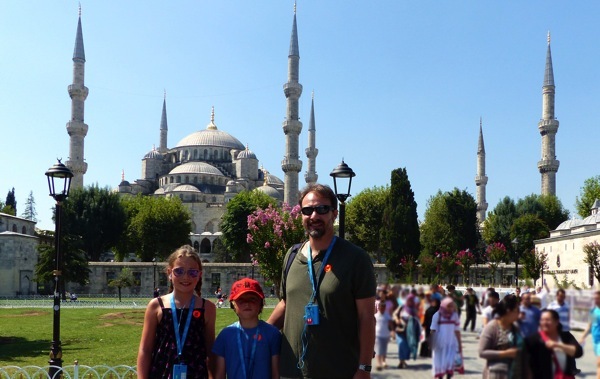 Me – excited to see the church we’ve read about so often in The Story of the World, with J(9) – a little weary after queuing in the heat to visit the Blue Mosque! 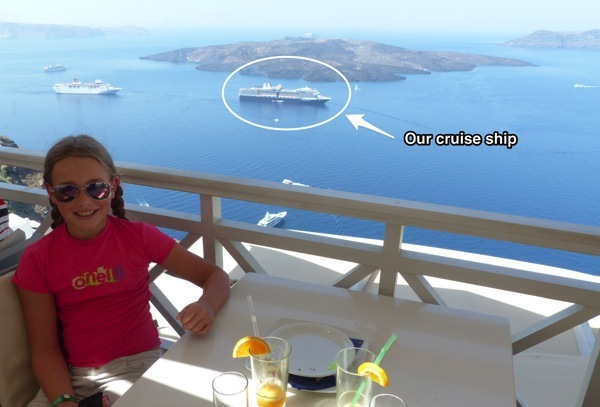 Okay, this one is an even more shameless excuse than the rest of this post to flaunt a few holiday snaps. But can you blame me? The Greek Islands are rather gorgeous, don’t you think? 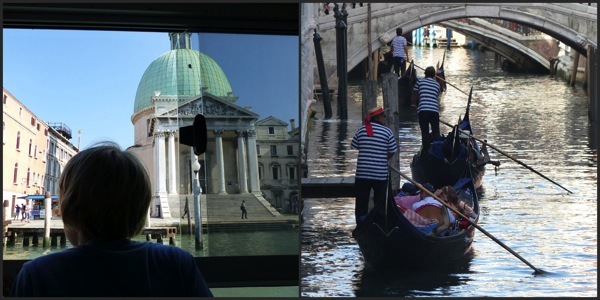 Have you visited any new places recently? What did you learn?